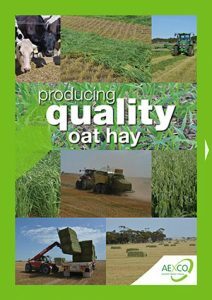 It is over 10 years since Producing Quality Oat Hay was published by the Rural Industries Development Corporation (RIRDC). To reflect developments since 2006, the Australian Export Company (AEXCO) has supported the production of this new edition. A FULL COPY OF THE PUBLICATION can be downloaded as a PDF (12MB) or as INDIVIDUAL CHAPTERS by clicking the cover image.